Obviously, digital cameras have made it easier for the artist who wishes to do “Night Paintings”. They take to night better than did print film. Colour slides were better. But those days are past. Historically, serious artists worked from life. When Tom Thomson painted his moose-at-night sketch, you can tell by the quality of the paint that it was done quickly, at shoreline: thin scrub…he could barely see in what little light there was…only the moon as the title tells us. (Moose at Night, Moonlight. Panel, 8 1/2”x 10 1/2” The National Gallery of Canada, Ottawa). I know the experience. Because of that painting by Thomson, the first image in the first “art book” I ever bought (THOMSON The Gallery of Canada Art: 2, by R.H. Hubbard. McClelland and Stewart Limited, 1962) I took to going out at night to capture images in emulation. This was in Rockcliffe Park, in Ottawa, (I was in the RCAF at the time as a photographer at Station Rockcliffe and at the same time nurturing an art career). I availed myself of street lamps instead of the moon. Van Gogh, to paint his night scenes, added candles to his straw hat so he could see at night. Inventive, aren’t we? Many night scenes were done from open doorways with lights overhead, or from studio windows. Many of my studios afforded such opportunities. I remember once, in winter, opening the door after shutting down the furnace, wearing my winter parka, sitting on a chair in the kitchen doorway (Prince George B.C.) painting the Monet-like row of poplars in front of me, timed to get the moon as it rose through the trees. (I did the same with sun-rises in fog, a red ball, through the same trees). I would take my sketch book outside and pinpoint the stars as they were at that hour, then dab them in in white on the black surface of the painting, giving so accurate a map of the sky that an astrologer could read time and location. I was having fun! Quebec City was a brightly lit place for doing paintings at night of the Terrace or the ferry coming in from the Levis side. Later, I used my imagination, especially on the prairie. I used blue in winter to create night, or an erie greeny shade, as Thomson did, for some of his night scenes. For this, I could work from drawings or turn a daytime oil sketch into a night scene. What ever it took. However we arrive at it, artists have long been fascinated by the moon and capturing it one way or another, even in interiors as Jeannette Perrault so aptly does. 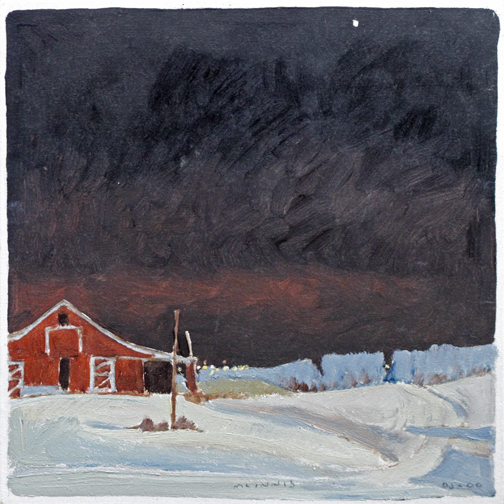 Quebec’s late painter Jean-Paul Lemieux made great use of the night sky in many of his most familiar paintings. Most notable is “Orion”, showing a lone figure against a snow-covered background and a black sky between the hills, the constellation “Orion” prominent in the sky. Night Painting is challenging but offers an opportunity to create moods that ordinary paintings do not. It is this challenge that appeals to many artists as this show at Roberts Gallery attests.